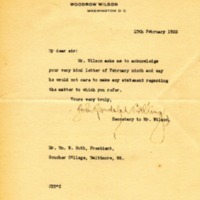 Bolling writes Guth on Woodrow Wilson’s behalf. Mr. Wilson asks me to acknowledge your very kind letter of February ninth and say he would not care to make any statement regarding the matter to which you refer. John Randolph Bolling, “John Randolph Bolling to William W. Guth,” 1922 February 10, WWP15066, Goucher College Collection, Woodrow Wilson Presidential Library & Museum, Staunton, Virginia.